Not only is it oozing with charm and retro appeal, but Jamie McMahon’s Acoustic Alarm also provides a subtler alternative to annoying electronic beeps, or local radio DJ banter, when it goes off in the morning. A simple pair of dials make setting the alarm time dead easy, while a toggle switch on the opposite side is used to activate, and presumably deactivate it, once you’re awake. 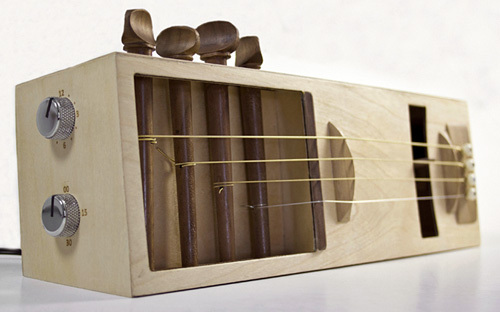 When the Acoustic Alarm goes off, a mechanism inside its sound hole gently strums a set of 4 guitar strings. It does sound a lot like the traditional electronic beep we’re probably all accustomed to, but considerably more pleasant. And if you’re not happy with the sound, like on a guitar the strings are connected to tuning pegs allowing to adjust the notes until you find something agreeable for your morning self. By Andrew Liszewski on 12/02/10 • Leave a comment! 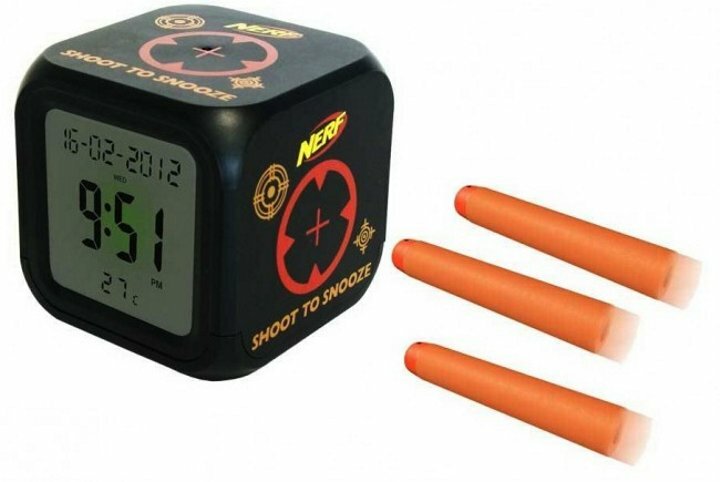 If it’s like Christmas morning every day in your home with your kids bouncing out of bed well before there’s even distracting cartoons on TV, this alarm clock is supposed to let them know when it’s appropriate to rise and shine, and when they should stay under the covers if they know what’s good for them. It’s claim to fame is a miniature streetlight that corresponds to the alarms set by parents. When it’s glowing red it subtly lets your kids know that they should still be sleeping, or at least keeping their crack-of-dawn wild child antics confined to their bed. But when the alarm goes off the light turns green letting them know they’re free to roam about the house. 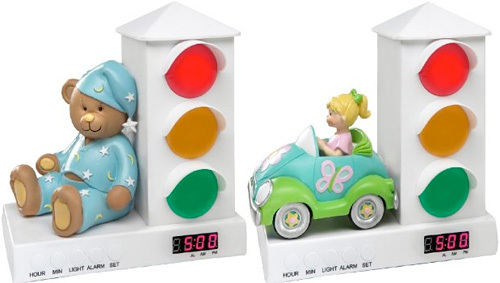 Apparently the yellow light is just there to complete the set, though I think it would serve as a good reminder every night that bedtime was getting close. $34.99 available directly from its website. 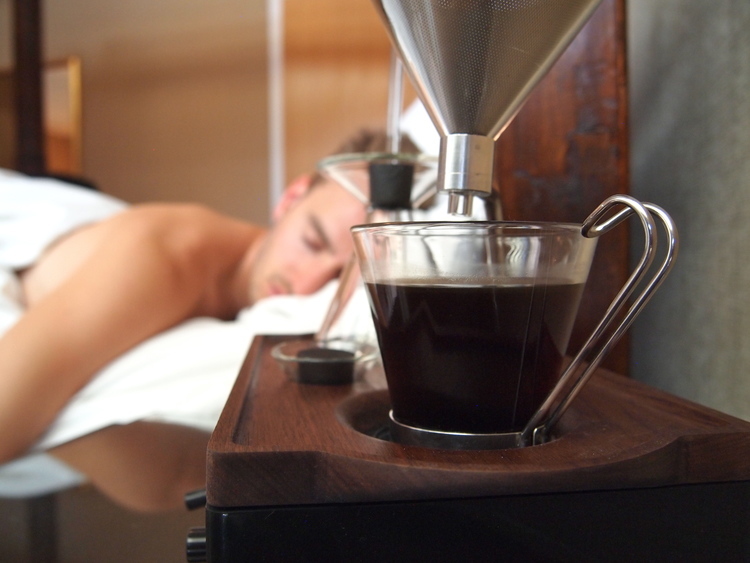 Tired of only one ear being punished every morning when your alarm clock goes off? 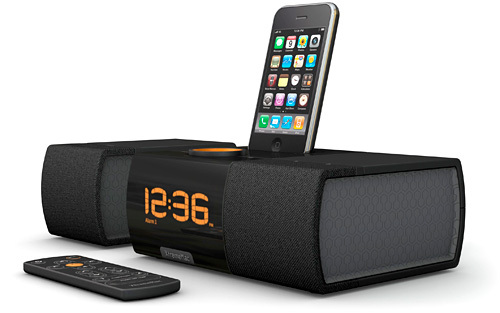 In addition to the new 3 in 1 Microdock we brought you yesterday, XtremeMac also unveiled their new Luna SST alarm clock dock on Wednesday which features a detachable speaker that can be placed on the opposite side of your bed for that full waking stereo effect. 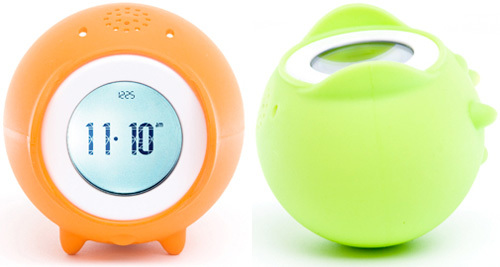 While the floating speaker isn’t wireless, it can be used as an independent alarm clock which is handy, even if it can only be set using the main unit. And like the 3 in 1 Microdock, the Luna SST can also be used with XtremeMac’s Alarm Clock app making it easier to set the alarms or choose what music you want to wake up to. The Beatles mono or The Beatles stereo… $129.99 listed as ‘coming soon’ on the XtremeMac website. 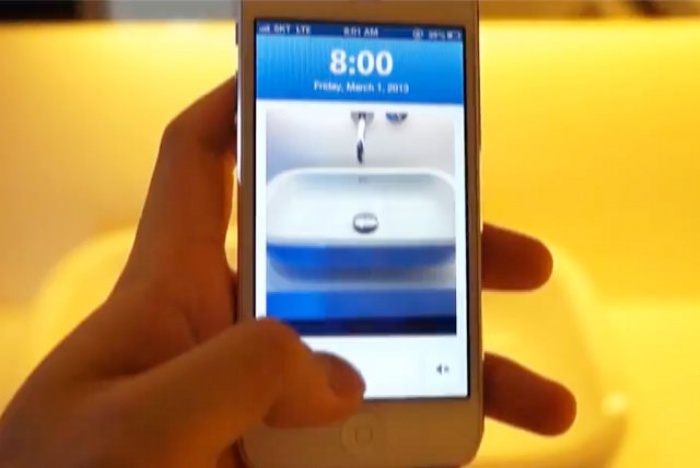 At just 4.7 oz it looks to be just slightly larger than the iPhone itself, but it includes a built-in speaker with “surprisingly big sound” and of course can be used to sync or charge your phone while docked. 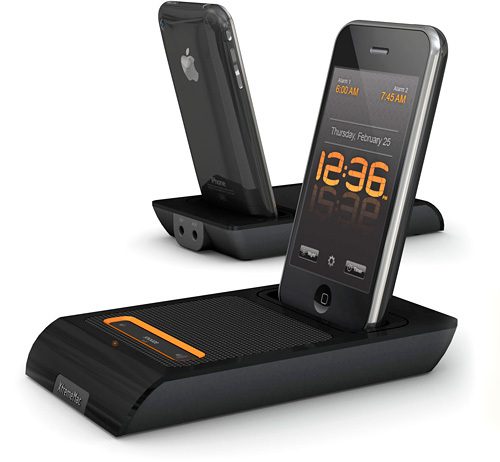 I think it’s the ideal alternative to other alarm clock docks that seem to be gaining weight every year, it comes with a travel pouch so it was probably designed with portability in mind. And while you don’t necessarily need the 3 in 1 Microdock to use it, there’s a basic but free XtremeMac Alarm Clock app you can download if you’d like your on-screen aesthetics to match the hardware. $59.99 available now. By Andrew Liszewski on 08/16/10 • Leave a comment! Remember Clocky? It was the alarm clock with a set of rubber tires that allowed it to drive off when the alarm sounded, forcing you out of bed in order to hunt it down and silence it. Well Tocky here is billed as its “tech savvy” younger brother, and instead of driving away on a set of tires, Tocky is able to simply roll away on its own once again forcing you to find where its ended up before you can silence the alarm. 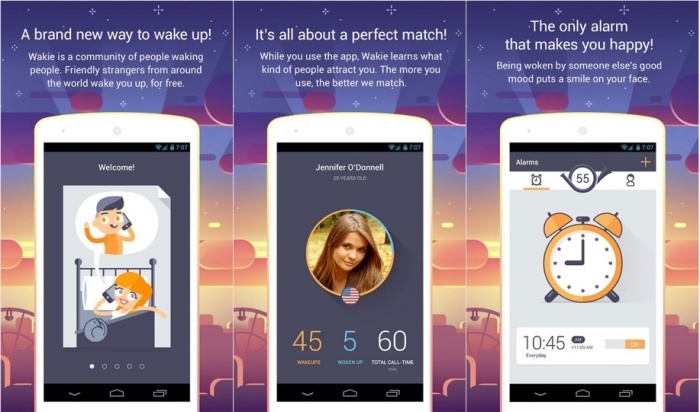 Annoying for sure, though it’s probably a very effective way to wake up in the morning. But Tocky isn’t just a one-trick pony. Besides its built-in escape mechanism it also has a touch sensitive interface which makes setting the clock and alarms as easy as spinning your ?nger around the dial. 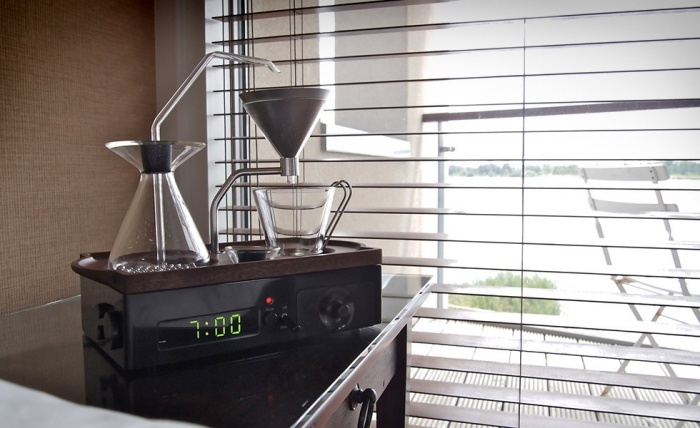 It’s also got a voice recorder if you prefer to wake up to the sound of your own voice and can be connected to a PC in order to upload MP3s if you prefer to wake up to music. Tocky is available in bright, playful colors like orange, white, aqua and kiwi and were it not for its $79 price tag I’d say it was a must-have for those of us who have to fight our way out of bed each morn.